The life cycle of the green bean plant lasts one year and is active from late spring until the temperatures begin to drop in the fall. The life cycle of green beans passes through five stages, from seed to the end of the growing season when seeds are again harvested. Being aware of the timing of each stage will help you understand when to plant and harvest your green beans as well as when to let the plants stop producing beans. Green bean seeds are usually planted directly into the soil. However they can be started indoors about four to six weeks before the last frost date. The best time to plant them outdoors is when the danger of frost has passed and the soil temperature remains a constant 65 degrees or warmer. The seeds prefer rich soil and a planting depth of about 1 inch. With warm temperatures and moist soil, green beans will germinate and sprout in roughly four to 10 days. Depending on the type of green bean, pole or bush, that you planted, the seedlings will begin their journey skyward. 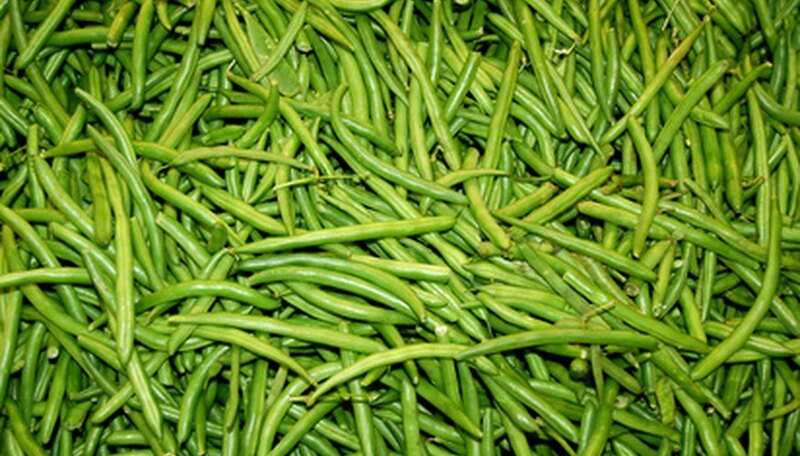 Bush-type green beans develop into a thick bush and reach a height of about 2 feet and a width of about 1 foot. Pole-type beans can reach 6 or more feet tall and will need a trellis. Beans begin to develop after about 45 days, perhaps sooner in warmer climates. Once the beans begin to appear, somewhere between 45 and 60 days after planting, they will mature quickly. Beans should grow long and straight, reaching about 4 to 6 inches in length, depending on the variety. Beans are harvested before they show signs of bulging from within and while the green bean is still firm. They should pull easily from the plant and create a “snapping” sound when broken in half. The plants will continue to produce beans throughout the growing season as long as beans are being harvested. The more frequently they are picked, the more beans will be produced. When the weather begins to cool off, the plants will stop producing and leaves will begin to drop. The plants are annuals and will not produce again next year. They should be removed and composted or destroyed. Fertilizer, if being used, can be added to the soil at this time to prepare it for next year’s crop. The green bean is actually a pod vegetable with its seeds inside. Normally the bean pods are harvested before the beans inside start developing. In order to have seeds for next spring’s crops, some pods are left to develop fully, growing very long and fat. The pods are left to dry out while hanging on the plant until the skins harden and begin to turn brown. Then they are picked, split, and the seeds are removed and saved for the following spring planting.